Ok...secondly...the image of Sasuke and Naruto is NOT mine. 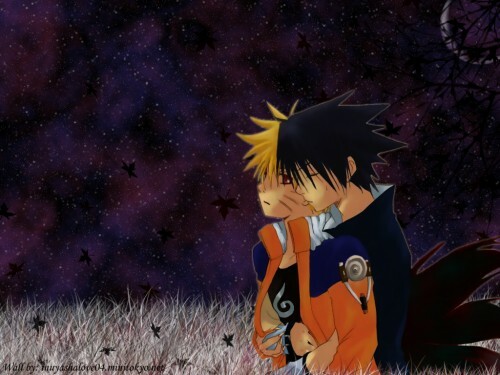 It can be found in the pictures of the Sasuke and Naruto Group. I was able to find the original site of the image, and it can be found Here. Wow...that's alot of typing! Just a few more things though. whaaa! looks great! an yr title sounds so much mor better than mai long winded one! XD! haha! *squeal* it's so pretty, i love it. Wah! Inuai-chan! It's great! :D Although, in my opinion, I would have made the moon bigger, but that's just me. I like big things on my wallpapers! XD But I love the tree! ;) Very cool! i love the image and the background is simply cool! hahahs naruto rocks my socks! I think it looks freaking awesome, good job. i'm not much for them as a couple, but i really like this one. *squeals out loud* It looks so cute :X Sorry *coughs* but I think the two do make a nice couple ... *coughs again* but I highly doubt that it will happen in the anime .. I think they really only see each other as friends and rivals. great wallpaper for a great couple! good job.